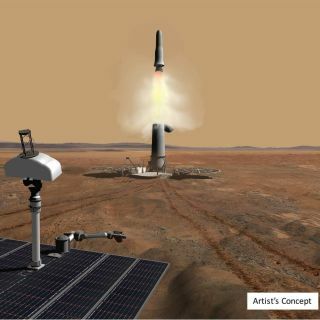 Artist's illustration of a sample-carrying robotic Mars Ascent Vehicle rocketing off the Red Planet under the watchful eye of an accompanying mini-rover. SANTA FE, N.M. — With NASA's sample-caching 2020 Mars rover mission just around the corner, the best strategy for hauling Red Planet rock and dirt to Earth is a now a topic of considerable discussion and debate. Spoiler alert: Rocketing pieces of Mars to our planet isn't an easy task! An objective of the workshop was to familiarize the international sample-analysis community with the Mars 2020 rover mission. That six-wheeled robot is being equipped to collect samples and cache them on Mars for future pickup and delivery back to Earth. NASA's Mars 2020 rover is scheduled to collect and cache select samples of Mars, which will be picked up by a future lander. The Mars rock and dirt would then be delivered to Earth for detailed study. NASA's Mars 2020 rover is scheduled to lift off in July or August 2020 and set down on the Red Planet in February 2021. At the moment, there are three landing site candidates, all of which are deemed good candidates to harbor evidence of past Mars life, if it ever existed. A decision on the final touchdown spot is expected next year. "Mars 2020 will gather samples for potential return to Earth in the future. It’s time for the sample-analysis community to get serious about defining and prioritizing Mars sample science, and in helping to make the case for the future missions that would get those samples home," said RSSB co-leader David Beaty, chief scientist for the Mars Exploration Directorate at NASA's Jet Propulsion Laboratory (JPL) in Pasadena, California. Hurling back to Earth pieces of Mars has been deliberated for decades, Beaty said, with the space science community patiently waiting for the time when such a robotic mission was feasible. "Well, it's getting real and the opportunity is there," he told Space.com. "But if we're not careful, it's possible to squander the opportunity." An awaiting Mars orbiter snags a capsule of specimens lobbed from the Red Planet. Caching a set of returnable samples is a top requirement for the 2020 rover, said Ken Farley, project scientist for the mission at the California Institute of Technology in Pasadena. The intent is to use the Mars machinery, Farley said, to find and characterize ancient habitable Martian environments, identify rocks with the highest chance of preserving signs of ancient Martian life if it were present, and, within those environments, seek the signs of life. A habitat docked with NASA's Orion spacecraft in Earth-moon space is part of a concept for the agency's Deep Space Gateway. The gateway could serve as a handoff point for Mars samples on their way to Earth. Joe Parrish, deputy manager of the Mars Program Formulation Office at JPL, detailed several possible sample-return strategies. "We're looking at a variety of mission architectures to do that," he said. One involves a small "fetch rover" that gathers up and moves the samples to a stationary Mars Ascent Vehicle, or MAV. Other ideas involve a larger solar- or nuclear-powered rover that's mobile and hauls around a MAV on its back for ship-and-shoot purposes. "The stock price as of today is higher" for the fixed MAV and fetch-rover concept over a mobile MAV, Parrish said, "but these stock prices fluctuate up and down." Engineers are delving into the pros, cons and challenges of all the concepts, he added. Once propelled off the Red Planet by the MAV, the encapsulated specimens would enter Mars orbit for rendezvous and pickup by a solar electric propulsion orbiter. From there, the grab-and-go courier service plan might involve shipping the samples directly back to Earth for a high-speed desert landing, Parrish said. The Mars samples could also be taken to the Earth-moon system for linkup with NASA's proposed Deep Space Gateway/Orion spacecraft facility, Parrish said. From there, a human crew could bring the Mars goods home to Earth. Tests are underway at NASA’s Jet Propulsion Laboratory in Pasadena, California, to demonstrate a direct-to-Earth Mars return-sample capsule and a high-speed desert impact. Scientists are already thinking about how to handle Mars samples here on Earth, said Francis McCubbin, astromaterials curator within NASA's Johnson Space Center's Astromaterials Research and Exploration Science Division in Houston. "Curation doesn’t begin when the samples come back. It doesn't begin when they arrive on Earth. And it doesn't begin when you're building a spacecraft," McCubbin said. "Curation begins at the inception of the mission." McCubbin said that Mars sample-return is going to present some distinctive challenges. For instance, Mars — along with Jupiter's moon Europa and the Saturn satellite Enceladus — is designated as a Planetary Protection Class V restricted Earth-return body. This term, he said, is reserved for cosmic objects deemed to be of significant interest to the process of chemical evolution and/or the origin of life. David Beaty, chief scientist for the Mars Exploration Directorate at the Jet Propulsion Laboratory in Pasadena, California. He is a co-leader of the Returned Sample Science Board set up by NASA as an independent diverse group of scientists. In regard to Mars rock and soil, there is a need to conduct, under strict containment and using approved techniques, timely analyses of the unsterilized sample collected and brought to Earth. "If any sign of a non-terrestrial replicating entity is found, the returned sample must remain contained unless treated by an effective sterilizing procedure," McCubbin said. Before any Mars specimens are released to the general scientific community for study, McCubbin said a "Sample Pre-Release Report" must be prepared to certify that the sample will not harm Earth’s biosphere. This report verifies that biohazard and life-detection protocols have been carried out and that samples are safe for release, he said. There is a body of research and techniques now used, in addition to know-how using high-level biosafety facilities, that can help guide the proper handling of Mars samples, McCubbin said. "Mars sample-return will present some unique challenges, but, honestly, I think the world is ready for this," he said. A Mars sample-return workshop, held July 23, 2017, in Santa Fe, New Mexico, brought together experts to discuss the prospects for a future mission to haul back to Earth Martian soil and rock. As the workshop wrapped up, RSSB co-leader Harry McSween, of the Department of Earth & Planetary Sciences at the University of Tennessee in Knoxville, said: "I hope everyone leaves this workshop with the belief that this is real now." "We are developing the technological ability to collect these samples and bring them back home," McSween said. "What is missing is the will. And the will is going to have to come from lobbying by the science establishment, particularly the sample community. I hope you'll take that message back." Leonard David is author of "Mars: Our Future on the Red Planet," published by National Geographic. The book is a companion to the National Geographic Channel series "Mars." A longtime writer for Space.com, David has been reporting on the space industry for more than five decades. Follow us @Spacedotcom, Facebook Google+. Published on Space.com.